This entry was posted on Sunday, December 24th, 2006 at 19:19	and is filed under Planet Gnome, Planet Gnomefr, Software. You can follow any responses to this entry through the RSS 2.0 feed. Both comments and pings are currently closed. Good work! Which networks (MSN? AIM? etc.) are supported? This is great! Thank you very much, this is a very needed feature on the GNU/Linux desktop. Thanks for this Christmas present. Its really wonderful and now I can persuade some of my known people to entirely remove a proprietary OS which they’re using for VoIP. Ronald: Since it’s using telepathy, anything implementing the Spec can be used transparently. At the moment, it uses jingle (jabber) which works between any two jabber clients implementing jingle (google talk is one of them, gossip telepathy is another, you have also the 770 using telepathy for example). Work was done on the oscar side this summer which is a bit stalled to reverse engineer the video protocol. 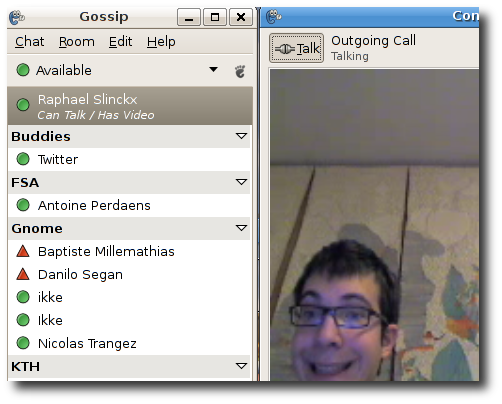 This would enable video/audio between ichat, icq, or aol clients. Là j’avoue, tu hyporises ta maman ours en slip… Je ne peux que m’incliner et te lécher les orteils ! I haven’t been up to anything recently. My life’s been really boring lately.